Doug Ketchen ran into some bad luck early in 1995. The starter at AAA Tucson, in his first extended time at the level and lost three quality starts, according to The Tucson Citizen. In this June game, though, Ketchan pitched well for the win, The Citizen wrote. "You can't get too concerned about breaks like that," Ketchen told The Citizen of his earlier outings. "You’ll kill yourself if you do that. I hope I can stay on this level, and if I can go out and pitch consistently like tonight, I think I will." Consistent Ketchen pitching never came. He pitched that season, his sixth as a pro, between Tucson and AA Jackson. That sixth season ended up being his last. He never made the majors. 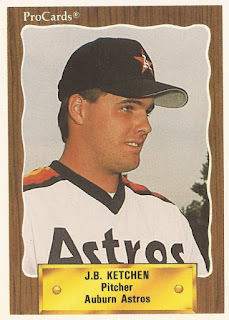 Ketchen's career began in 1990, taken by the Astros in the 28th round of the draft out of Cal State Fullerton. Ketchen, who also went by J.B. Ketchen, was from Calgary, Alberta. He started with the Astros at short-season Auburn. He went 6-5 there, with a 3.40 ERA. He moved to single-A Asheville for 1991, then high-A Osceola in 1992. He threw two scoreless innings that June, part of an overall 2.79 ERA at Osceola. Ketchen then made AA Jackson for 1993. He went 7-12, with a 4.11 ERA. He played most of 1994 back at Jackson. He also got two outings at Tucson. He turned in an overall 4.15 ERA. His final season came in 1995 between Tucson and Jackson. He had a 6.28 ERA at Tucson and a 3.59 mark at Jackson, ending his career. Ketchen has since made his home in Arizona, pitching in a men's baseball league near Phoenix in 1999 and more recently serving as varsity pitching coach at Cactus Shadows High School. In 2013, Ketchen spoke to Images Arizona about one of his player's baseball prospects. He also touched on his own playing career and its end with his release by the Astros. "I enjoyed it. I had a good career," Ketchen told Images. "And then my son was born. Life sort of changed for me. I gave it 100 percent, but it was time to move on and get back to the real world."